Two aircraft thought to belong to Misratan forces are reported to have bombed Brak Al-Shatti airbase this afternoon in reprisal for the airstrikes on Tamenhint airbase this morning. It is not known if there are any casualties. Attempts to contact the authorities in Brak have been unsuccessful so far. 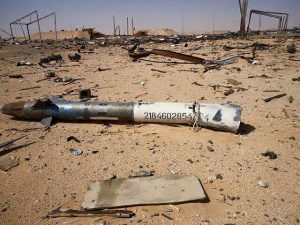 It is believed the LNA aircraft involved in the Tamenhint strikes flew from the Brak airbase, itself taken over in early December by LNA units under General Mohamed Ben Nayel after Misrata’s Third Force had to pull out. The general’s forces are now besieging Tamenhint. There, it has emerged, there were no casualties in this morning’s attacks. These, according to a local resident, hit only the perimeter area. The Third Force were still in control, the confirmed. It has also emerged that yesterday evening LNA aircraft once again attacked Jufra airbase, some 350 kilometres northeast of Tamenhint. It is held by Misratan forces as well as being a operating base for the Bengahzi Defence Brigades. The LNA airstrikes targeted weapons storage. A large force comprising mainly the Benghazi-based Zawiya Martyrs Brigade led by Brigadier Jamal Al-Zahawi is meanwhile reported to have set out today from Benghazi to attack the Jufra base. Last week, Zahawi was appointed by the LNA general command as head of its Jufra operations room.